Six Chix is a comic strip written by six different women. This one was done by Martha Gradisher and appeared on April 18, 2017. Well, being retired (or something like it) does help in going barefooted. 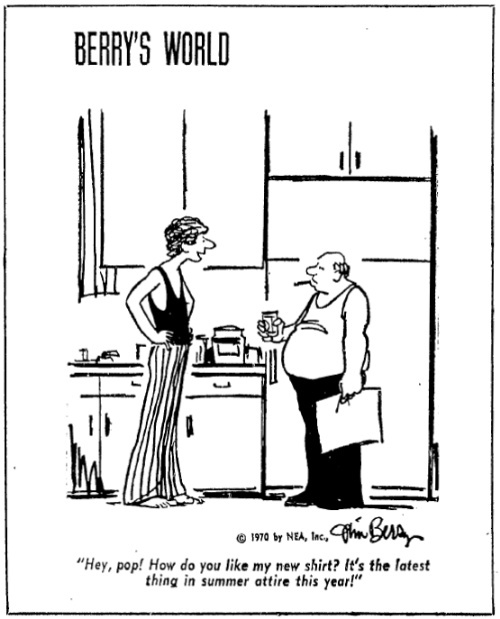 This comic is from Berry’s World, written by Jim Berry. It appeared on June 11 in 1970. While the joke does not revolve around bare feet, we can see that bare feet were the style of the day (and that “style” helped contribute to NSNSNS signs). Our cartoon for this weekend is from Off the Record, which was drawn by Carl Kuhn from 1935-1940, and by Ed Reed from 1946-1984. 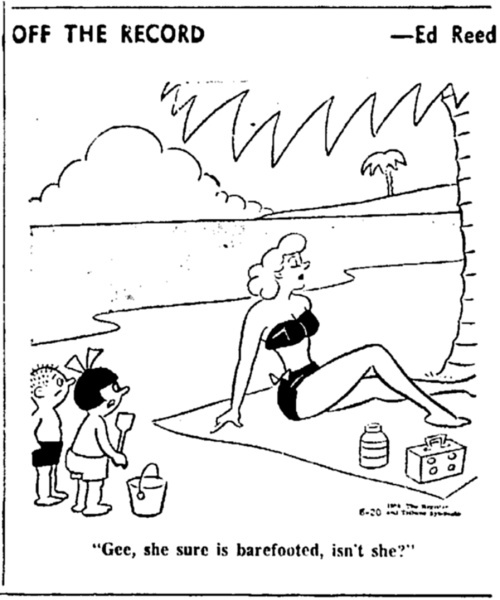 This one is from August 20, 1954 (back when what you see would have been considered a scandalous bathing suit). Last week’s comic had Wallace the Brave (by Will Henry) tossing his shoes into the bay at the start of summer (because he never wears shoes during the summer, and because “tradition!“). This is the follow-up to that one, dated June 21, 2017.